It seems our representatives in the State Senate and Assembly need a reminder of their primary duties. Not that they care, but the people as their boss should. The Senate’s motto. “Senatoris est civitatis libertatem tueri”, or if you’ve never had the curiosity to find out what those omnipresent words hovering above you translate to, “It is the duty of the Senators to protect the liberty of the citizens”. 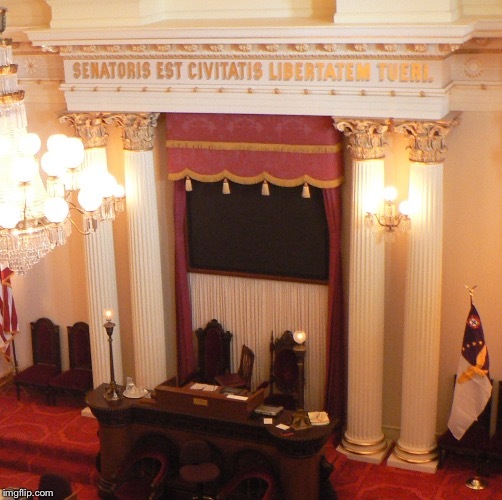 Yes, it actually says that in the California State Senate Chamber, where liberty goes to die and is considered a dangerous loophole that must be closed. It would be funny if it wasn’t so tragic; irony may have to take the week off. Maybe the problem is that it’s in Latin; while it may look pretty and seem all enlightened, it’s completely meaningless to anyone else looking at it, like tattoos of Chinese characters that were so popular in the 90s. Perhaps the recent repealing of English Only education will offer an opportunity for Latin to make a resurgence, but I don’t think that’s what Latinos had in mind. For you Assembly Members, your motto is, “Legislatorum est justas leges condere”, or “It is the duty of legislators to pass just laws”. To us, the people who have never victimized anybody but can be arrested, prosecuted, and convicted of crimes we knowingly or unknowingly break everyday by exercising our rights and liberties due to laws you’ve passed, we can legitimately, categorically, and unequivocally state that you have utterly failed at your primary duties: protecting liberty and passing just laws. You haven’t just failed, you’ve actively taken it upon yourself to be openly hostile to liberty and justice. It’s proudly in your political platform. And somehow you keep your job. I guess it says more about your boss than it says about you, but not much. We’ve obviously just had an election in which the new State Senate and Assembly will take office December 5th. To our new Senators and Assembly Members, welcome! I’d like to take this opportunity to highlight and acknowledge a few of you. Congratulations, CA 29th District State Senator Josh Newman (D), for defeating Ling-Ling Chang (R), a registered tyrant and backstabber. Tyranny knows no party, but I’d rather see a tyrant coming from the front than the back. I see that you’re a veteran and support veteran causes. I hope you’re sensitive to the fact that veterans really hate being told to fight and kill to protect our freedoms back at home only to see the freedoms they fought and killed for being stripped away by your colleagues. And you should already know veterans by and large like their guns. Be wise with your supermajority, follow the Senate’s motto, and you won’t earn a place on the Tyrant Registry like your predecessor. A big congratulations to the registered tyrant formerly known as Assemblywoman Toni Atkins (D), who recently has identified as a State Senator, for coming out and being fully embraced and accepted by her constituents as a Trans-Senator. Your wife Jennifer must be very proud and supportive of your brave decision. Though we will refer to you by your new label “Senator” while you are transitioning, make no mistake, you are what you are: a registered tyrant. By far, she isn’t the first openly Trans-Senator; Kevin de Leon also transitioned in 2010 from an Assembly Member to Senator. As a matter of fact and opinion based on observation, most Assembly Members dabble with transitioning to Senator, but may not get the support, acceptance, or attention they’re craving. The biggest argument against term limits is these legisexuals jump in and start writing a bunch of laws as quickly as they can to make a name for themselves, so when they’re termed out they can transition to the next office and so on. We’ve seen a steady increase in gun laws since term limits were implemented in California, not to say term limits are the only reason for this but likely a contributing factor. Finally, to Assembly Member Heath Flora (R), the newcomer who bested Ken Vogel (R) for the open 12th District seat… bro, do you even lift? You do? Well then… if you plan on working with your Democrat colleagues to “get things done”, be sure to limit your “doing” to things like building dams instead of “doing” us out of our rights and liberties. Your district of which I’m a citizen doesn’t support the policies of SF or LA, and I’d really hate to have a backstabber as my representative. If I seem a little overly hostile, it isn’t you; I’m just a “one bitten, twice shy” kind of guy. Good luck with the legisexuals and tyrants you’ll be surrounded by; hopefully it doesn’t rub off on you. To the rest of you legisexuals and tyrants: at least attempt to recognize your duties. Tread carefully… not that your boss seems to care, but I do. And I’ll be watching.